Are you a fan of the horror genre? We are too! So let's talk horror! We've seen some quite some horror movies. Old, new, good, bad, originals, remakes: You name it. Looking for another horror movie to watch? Let us help you with some inspiration! How did you get into horror? I've always loved watching horror movies! I can't remember that I ever didn't. I started with movies like 'It' and 'Carrie'. I wasn't scared. But I just really liked watching these types of movies. So I watched more and more. And learned more about the horror genre. Because there are so many types of horror movies. You've got the zombie movies, the paranormal movies, psychological horrors, gore movies and so much more! The type of horror movie that's way down on my list is the paranormal horror movie. The Grudge, the Ring, Paranormal activity: That'not for me. I have no specific favourite movie genre, but when I was 16 I loved watching horror movies and I watched almost every title in the horror section of our local videotheque. I watched a lot of really bad ones, but still I enjoyed watching them. Of course I loved the Stephen King adaptations like "Carrie", "It" and "The Shining". Another movie I remember watching was "House" (1986) and now that I'm writing this I realize that I haven't watched this one for a really long time. I wonder if I will still like it. I'll let you know when I rewatch it. My alltime favourites are "The Exorcist" and "The Omen". I think the whole atmosphere in these movies is just great. I also liked the original "Halloween" movies and the original "Dawn of the Dead". So it's safe to say that my preference goes out to the horror movies of the 70's and 80's. Looking at the more recent horror movies I think "Scream"(1996), Saw (2004) and "The Blair Witch Project" (1999) are great. My guilty pleasure is "Wrong Turn"(2003). I liked horror movies for as long as I can remember. I think it really got me interested when Gabber music started getting big in the 90's in the Netherlands. The Thunderdome CD's had all these pictures of iconic horror figures on it. For example, a Mummy, a Werewolf, but also Chucky and Pennywise. Also there were CD's under the name Hellraiser which all had images of Pinhead on the cover. These pictures intrigued me and I wanted to see these films. I think I was about 10 years old at the time. Me and a friend of mine were always at the video rental shop looking at the covers of horror movies. But his mom always said we weren't allowed to rent any movies from the horror section. But next to the horror section was the science-fiction section and there was the VHS of Alien. And oh my did that cover look interesting. So we just rented this, since it wasn't in the horror section. And since that day I've been hooked to horror movies. When I got older I started watching the old Universal horror movies, Dracula was my first. I instantly loved it. Not short after that I also learned about the 70's/80's european horror movies by Lucio Fulci, Dario Argento, Mario Bava and many more. I never really got into the more recent horror movies (after 2000). Though there are some exceptions. I like the Rob Zombie films a lot. Some others I really enjoy are, The Dead 1 & 2, The Descent 1 & 2, A Serbian Film, Saw. I'll share 3 horror tips with you as well. It is really hard to pick just 3, I have so many great movies in my collection. So I've chosen to pick 3 from different eras. I'll started with the newer ones. The first one is The Dead. There is also The Dead 2 which I also like a lot. But the First one is the best. It's a zombie movie which takes place in a desert in Africa. It's a pretty basic survival story. But the movie does a great job at giving feeling of desolation. Also the zombies are slow moving like in the Romero films. And in my opinion that's the way it should be. The Dead 2 takes place in India and the zombies are in a more crowded environment. The story is more of a love story. It's about a guy and a girl who are very much in love. But the parents of the girl don't agree with this. Then the girl finds out she is pregnant, she tells the guy this news on the phone. At this moment the zombie epidemic starts, but the guy is 500 kilometers away from her and wants to get there as fast as possible. So yeah that was 2 movies actually, but anyway. The next movie tip I have is Beyond The Darkness. Also known as Buio Omega. It's an Italian horror movie from 1979 by Joe D'Amato. The main character Mark's girlfriend dies. After this he becomes totally insane. He actually exhumes here corpse and guts her, stuffs her and replaces her eyes with glass eyes. He wants to keep her with him forever. After this Mark becomes even crazier, you just have to watch it to find more about it ;). The movie has some great gore effects. But the movie has also a very sickening feeling to it. It also brings up a topic with a big taboo, necrophilia. This movie is one of my favorites of this era and I'd recommend it to anyone who enjoys horror movies. And last but certainly not least is The Raven (1935). This movie stars 2 of my all time favorite actors: Belá Lugosi and Boris Karloff. The 2 have done amazing films and have done a few more together. But this one I think is the best. In my opinion it's even the best horror film of the black and white era. The story is loosely based on the Edgar Allen Poe poem of the same name. Lugosi plays a surgeon who saves the life of a beautiful woman. After that he falls in love with her and really wants to have her. But he can't because of her fiancé and father. So he hires a wanted criminal played by Karloff to do his dirty work. He mutilates his face and promises that if he completes the job he will restore his face again. Lugosi is an absolute madman in this one, and it really shows his acting talent. So if you like the old black and white films and you haven't seen this one, go watch it now! I'll share 3 horror tips with you. I have a thousands, but well I need to draw the line somewhere. For now. So I chose 3 you might not know yet. The first one is Misery. This my all time favorite movie! I was so impressed when I watched this. A famous author has a car crash. He's rescued by a fan. But she's holding him captive & abuses him.. I always doubt if I can say this is a horror movie. But I've never felt so much tension in a movie! And there are horrific scenes. I'd just really recommend watching this movie. Cathy Bates is an outstanding actress. And the movie holds you in it's grip. The only thing you can do is keep watching.. And feel for the poor author.. The next one I'm recommending is Milo! I rarely see this movie somewhere. I've never seen it on DVD just on it's own. I've only seen the one I own: the one with 2 movies on 1 DVD. The movie only has a 4 on imdb and it's being criticized for all the violent, blood & gore. But this movie will always stick to me because it's one of my first horror movies and the first one that really made an impression. In the movie, a young girls was murdered by Milo. Her friends witnessed the murder. 16 years later, the friend meet up again. They believe Milo drowned. But Milo is still alive..
That brings me to my last tip: the Devil's Rejects. A Rob Zombie Movie. Do I need to say more? If you haven't watched a Rob Zombie movie before, you should! I love them. 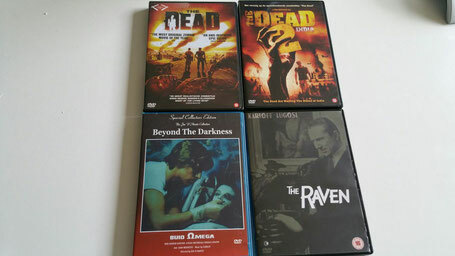 (Other Rob Zombie movies are for example The Lords of Salem, House of 1000 Corpses and more! The Devil's Rejects is actually a sequel to House of 1000 Corpses. The movie is about the Firefly family. they're back an they're on the road to escape the police force. But they're very dangerous! Let us know: What's your favorite scary movie? Ohhhh horror movies. No let's not talk about it haha. I always avoid horror because I'm so afraid to watch horror movies haha!!! I'm always interested in what people like about that though. My favorite kind of horror movies would be zombie movies. I also fancy zombies for computer, books and even tabletop games! There's somethign about the undead that brings out the competitive streak in me. I am a massive horror fan. I have to admit my dad used to force me to watch them when I was younger that I am now immune to ever being scared at a movie. I thrive off them now lool! I have to agree, Misery is a favourite, and The Shining isn't far off. The Amtyville Horror is another favourite! I can say that I am not a fan of horror movies. However, I do remember when I was running a hostel and all the staff gathered one night to watch the movie "Hostel". It was terrifying, haha.